Because you must provide a link to your code repository as part of pipeline setup, have the code repository ready before you create your pipeline. 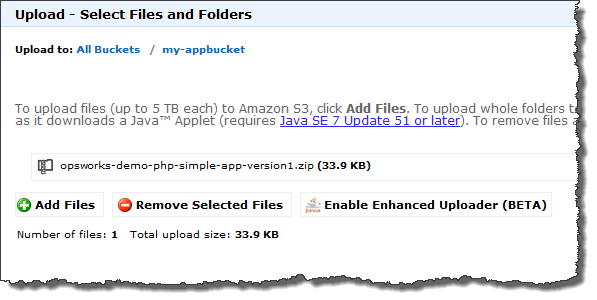 In this walkthrough, you upload a PHP app to an Amazon S3 bucket. Although CodePipeline can use code directly from GitHub or CodeCommit as sources, this walkthrough demonstrates how to use an Amazon S3 bucket. The Amazon S3 bucket enables CodePipeline to detect changes to the app code and deploy the changed app automatically. If you wish, you can use an existing bucket. Be sure the bucket meets criteria for CodePipeline as described in Simple Pipeline Walkthrough (Amazon S3 Bucket) in the CodePipeline documentation. The Amazon S3 bucket must be in the same region in which you later create your pipeline. At this time, CodePipeline supports the AWS OpsWorks Stacks provider in the US East (N. Virginia) Region (us-east-1) only. All resources in this walkthrough should be created in the US East (N. Virginia) Region. The bucket must also be versioned because CodePipeline requires a versioned source. For more information, see Using Versioning. From the GitHub website, download a ZIP file of the AWS OpsWorks Stacks sample PHP app, and save it to a convenient location on your local computer. Be sure that index.php and the ASSETS folder are at the root level of the downloaded ZIP file. If they are not, unzip the file, and create a new ZIP file that has these files at the root level. Choose the bucket that you created from the All Buckets list.